Our commitment to Employer and Student privacy. S2DNT UK Limited ("We") respects your rights to privacy and is committed to protecting and respecting your personal data. This policy sets out the basis on which any personal data we collect from you, or that you provide to us, will be processed by us. Please read the policy carefully to ensure that you understand our practices regarding your personal data and how we will treat it. By visiting and using the Toptask website (www.URL.com - the “website” or “site”) you are accepting and consenting to the practices and the treatment of your data described in this policy. For the purpose of the Data Protection Act 1998 (the Act) or any regulations which may supersede it, the data controller is S2DNT UK Limited a company registered in England and Wales with company number 09812957. Information you give us. You may give us information about you by filling in forms on our site, uploading information about yourself and your skills/requirements to the app, or by corresponding with us by phone, e-mail or otherwise. This includes information you provide when you use our site or app to order or request any information about any of our products or services, or if you report a problem with our site or app. This information that you give us may include your name, address, e-mail address and/or phone number. Information we collect about you. With regard to each of your visits to our site we may automatically collect the following information: Technical information, including the Internet protocol (IP) address used to connect your computer to the Internet, your login information, browser type and version, time zone setting, browser plug-in types and versions, operating system and platform; information about your visit, including the full Uniform Resource Locators (URL) clickstream to, through and from our site/app (including date and time); products you viewed or searched for; page response times, download errors, length of visits to certain pages, page interaction information (such as scrolling, clicks, and mouse-overs), and methods used to browse away from the page and any phone number used to call our contact number.Location data from your mobile telecommunication device or your IP address. 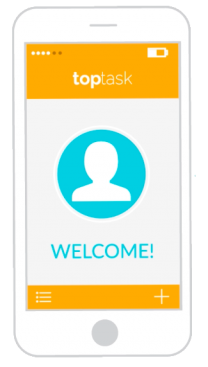 If you turn on your devices geo-location function (or ‘GPS’) and use Toptask while it is active then we will use your geo-location data to match you with other users of the service who are in close proximity to you. Our processing of this kind of data is temporary and is only done in the course of delivering the app’s services to you. We do not store any geo-location data which you provide to us. Information we receive from other sources. We may receive information about you from other sources and/or organisations. We work closely with third parties (including, for example, business partners, sub-contractors in technical, payment and delivery services, advertising networks, analytics providers, search information providers, credit reference agencies) and may receive information about you from them. Information exchanged via the App: For security and customer service purposes, we reserve the right to oversee any exchange of information and communication between users via the App. Information you give to us. We will use this information: 1) to provide the app and site’s functionality to you, which includes the process of matching you with other users of the service, advertising your services/assignments to them, and facilitating you making contact with them in order to agree on the terms of assignments; 2) to carry out our obligations arising from any contracts entered into between you and us and to provide you with the information, products and services that you request from us; 3) to provide you with information about other goods and services we offer that are similar to those that you have already purchased or enquired about; 4) to provide you with information about goods or services we feel may interest you. If you are an existing customer, we will only contact you by electronic means (e-mail or SMS) with information about goods and services similar to those which were the subject of a previous sale or negotiations of a sale to you; 5) to notify you about changes to our service; 6) to ensure that content from our site and app is presented in the most effective manner for you and for your computer. Information we collect about you. We will use this information: 1) to administer our site/app and for internal operations, including troubleshooting, data analysis, testing, research, statistical and survey purposes; 2) to improve our site to ensure that content is presented in the most effective manner for you and for your device; 3) to allow you to participate in any interactive features of our service, when you choose to do so; 4) as part of our efforts to keep our site safe and secure; 5) to measure or understand the effectiveness of advertising we serve to you and others, and to deliver relevant advertising to you; 6) to make suggestions and recommendations to you and other users of our site about goods or services that may interest you or them. Advertisers and advertising networks that require the data to select and serve relevant adverts to you and others (often known as ‘programmatic’ advertising). If Toptask and/or S2DNT UK Ltd. as well as all of its assets are acquired by a third party, in which case personal data held by it about its customers will be one of the transferred assets. If we are under a duty to disclose or share your personal data in order to comply with any legal obligation, in order to enforce a contractor with you, or to protect the rights, property, or safety of Toptask, our customers, or others. This includes exchanging information with other companies and organisations for the purposes of fraud protection and credit risk reduction.